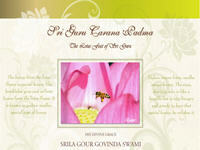 This website is dedicated to “Sri Guru Carana Padma” a single lecture given by Srila Gour Govinda Swami Maharaja based on the prayer Sri Guru Vandana. Audio is available along with the transcription. Category Multimedia, Sannyasis June 17, 2012 by ISKCON Desire Tree.